The Sensidyne Cyclone Assembly Kit is designed to separate the respirable fraction of airborne dust from the nonrespirable fraction in order to provide the most representative sample. The Sensidyne Cyclone Assembly Kit utilizes a 10mm nylon cyclone as specified in NIOSH sampling methods for nuisance dust (#0600) and silica dust (#7500, 7501, 7601, and 7602). The unit includes a two stage sampler consisting of a 10 mm nylon cyclone and membrane filter. The cyclone, when operated at an air flow rate of 1.7 LPM (as recommended by NIOSH) effectively removes nonrespirable particles. The smaller respirable particles are deposited on the filter membrane for subsequent weight determination and analysis of chemical composition. Although designed specifically for pneumonconiosis-producing dusts, the cyclone sampler is effective for monitoring the respirable fractions of all types of dust from highly toxic ones to nuisance dusts. Note how closely the separation achieved by the Cyclone Sampler (red curve) follows the convention for separation of respirable particles, as specified by ACGIH (black curve). Few other cyclone separators show such a close fit of actual to ideal performance. For example, 100% of 10 micron particles and 50% of 4 micron particles are removed by the cyclone. This corresponds with 0% of 10 micron particles and 50% of 4 micron particles that penetrate the lower lung. 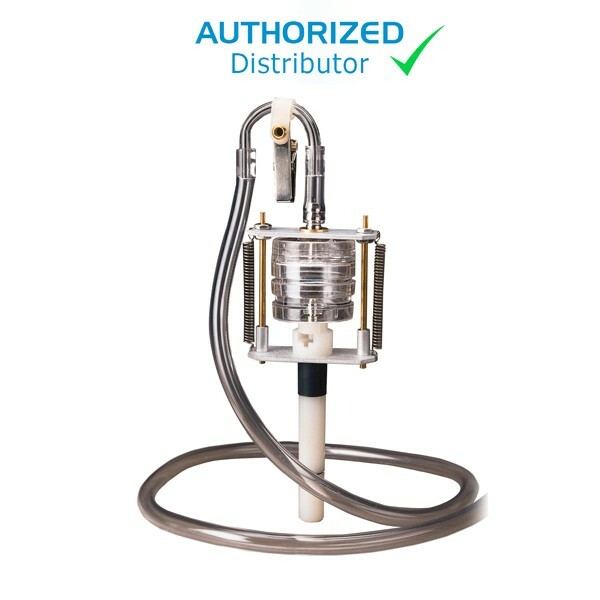 Positive seal with leak free design Cyclone Calibration Jar When ordering a cyclone sampler, be sure to also order a Cyclone Calibration Jar. Since a cyclone has only a single hose connection, this jar allows proper placement of the cyclone filter between the sampling pump and the calibrator device, as shown.